Elaine Hancock (Olney, United States) on 17 June 2016 in People & Portrait. In the Piazza San Michele in Lucca. Joli décor pour le déjeuner des pigeons. a very compassionate gesture!! The birds must be seeing him everyday!! Avec son vélo ce sac il donne à manger aux oiseaux quelle belle scène. Nice street scene, great rendering ! Breaking bread is one way to make friends. I like this capture of this fellow feeding the birds. I hope taking his picture didn't interrupt this feeding. 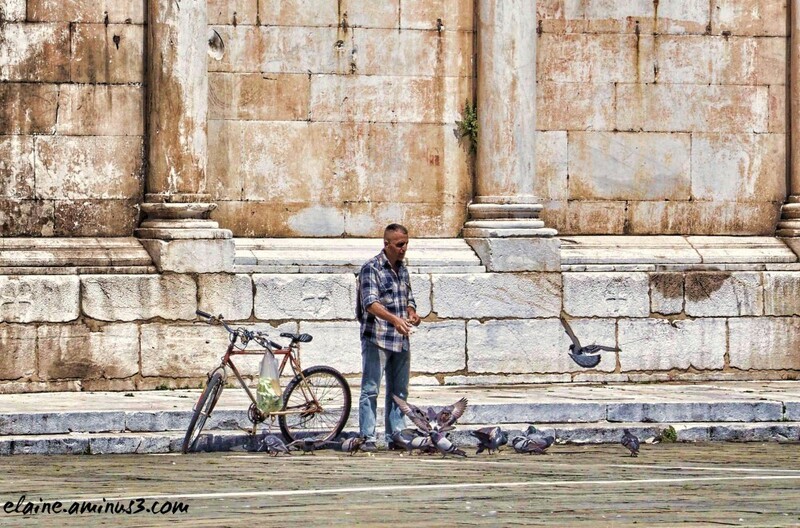 It is nice to see that all over the world people enjoy feeding the birds! A delightful image. Good people are everywhere. nice photo. Thank you for sharing. A kind person and a lovely background. Wonderful wall and column backdrop for this charming scene.